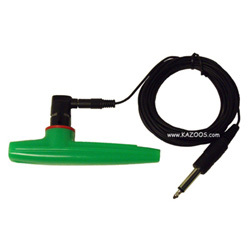 Plug your new electric kazoo into any effects box, pedal, computer or straight into your amp. The sound possibilities are endless. The Hummbucker Electric Kazoo is sure to surprise with a professional grade dynamic pickup specially designed to fit Kazoobie plastic kazoos. Comes equipped with a 15' cable and 1/4" jack. The cable also detaches at the pickup for easy replacement. You get a Kazoobie Kazoo, Hummbucker Pickup, and 15' cord.